Photo By: Steve Clark Car Fires can be very dangerous!! WHY DO FIREFIGHTERS underestimate them? Why do we not always breath air? And use the reach of the stream. Your not gonna save it!!! Escambia has had numerous cars that were well involved, start up and lundge forward while burning. Always stay clear of front and rear. Newer vehicles are more prone to exploding and dropping there fuel load. Fuel tanks of today are plastic and will spill out and become running fuel fire. Should always have extinguisher available. 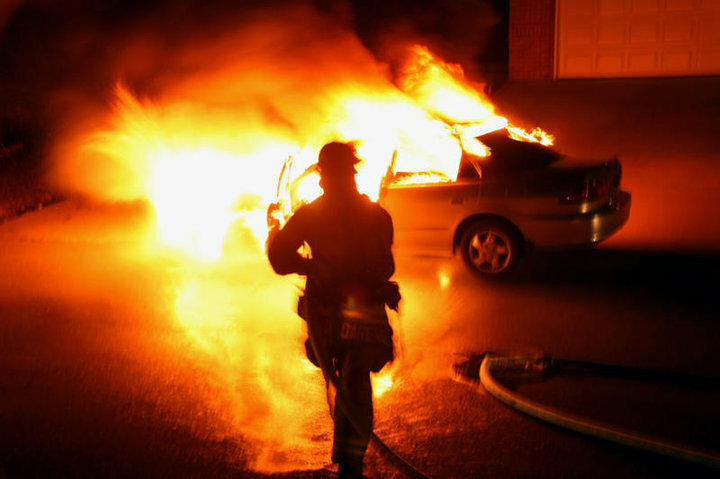 Car fires are one of the most underestimated fires we respond to. People carry all kinds of things in their cars and have numerous homegrown upgrades with radios and such so we never know what we are going to find. I responded to a car fire started by a guy cooking meth in the passenger seat. Talk about unexpected. We need to always be masked up, upwind, and uphill from these fires. They can kill us too. take a dry chem everytime! Had a firefighter get burned a couple years ago when a gas tank ruptured. Dry Chems should be a standard on all car fires. Escambia County FIre Rescue had a hood strut explode and hit the nozzleman on Sunday October 23, 2011. FULL GEAR BREATHING AIR.